RS232/RS485 port for connection to PC, PLC or repeater. RS232 port configurable for connection to printer. IR input for managing the remote control. CE-M 3000e approved (OIML R-76 / EN 45501). 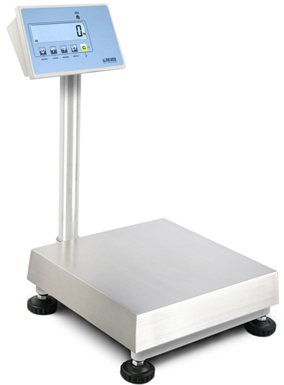 Bench and floor scales with column, characterized by multifunction weight indicator, completely stainless steel structure. Easy to use and versatile, guaranteeing precision and reliability. Particularly suitable for industrial and commercial use. Available also in CE-M approved version according to OIML R-76 / EN 45501 standards. Weight indicator with waterproof IP65 STAINLESS STEEL case. Backlit 25mm LCD display with 6 high contrast digits and icons for indication of active functions. Waterproof 5-key functional keypad. Functions with an aluminium load cell, protected in IP65 stainless steel cover, approved according to OIML R60 C3 standards (3000 divisions). Stainless steel structure, with adjustable resting feet and level. Stainless steel loading surface, size: see the table. - 700 mm in the "X" models. Digital calibration and set-up from keypad or from PC with DINITOOLS. Power supply: 230 Vac power supplier. KEYBOARD: Zeroing, Automatic tare, Presettable tare, printing and/or data transmission, selectable function command, on/off switching. - Print of barcode 39. CT4 ISO 17025 calibration certificate from 6 to 60 kg. For precision and industrial scales, crane scales. CT5 ISO 17025 calibration certificate from 61 to 300 kg. For precision and industrial scales, crane scales. ECEM CE-M Single platform/scale legal for trade approval. ECEMDOC Printed EU declaration of conformity, EU certificate of test and test certificate (Free if downloaded from the web, only for approved CE-M scales). € NET. SWM WeiMonitor PC program for monitoring and recording weighs in real time, from one or more scales (price of a license for a single scale management). RSCBUSB-1 USB PC/RS232 converter cable, l=1,5m. USB/RJ11 connector. PBISTF Stainless steel fixing bracket for mounting the DFWLI indicator. All the specifications and images can be subject to variations and upgrades without prior notice.